You should get enough vitamins from your diet for your body to properly function. Not getting sufficient nutrients — a vitamin deficiency — can cause a hormonal imbalance. 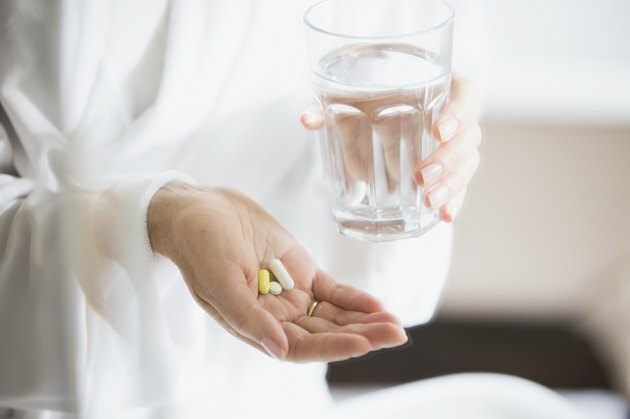 Taking too many supplements — a vitamin excess — can also cause a hormonal imbalance. A well-balanced diet and wise supplementation will give you the vitamins for hormonal imbalance. Dietitians typically organize vitamins into two categories. Water-soluble vitamins quickly dissolve, so they easily pass through your body. Fat-soluble vitamins need fat to be absorbed, so they can accumulate in your body. Be wary of taking high doses of fat-soluble vitamins, because excessive intake can cause hypervitaminosis. This serious medical condition occurs when your body builds up abnormally high levels of a vitamin. It can damage your organs, and put you at risk for hospitalization. You can decrease your risk of hypervitaminosis by speaking with a healthcare professional before self-diagnosing a hormone imbalance or taking a nutritional supplement. With this expert guidance, you can use vitamins to balance hormones. Your endocrine system uses 50 different chemicals for cellular communication. Scientists call these messengers hormones. Ten different glands synthesize and release these hormones. When released, they spread throughout your body. Doctors have determined a reference value for each hormone. These values change depending on personal variables like reproductive status, gender and age. If the level of a hormone is less than the reference value, you have a hormone deficiency. If it's more than the reference, you have a hormone excess. Vitamin D has a similar chemical structure as several hormones. Because of this similarity, vitamin D greatly impacts your endocrine system. Vitamin D is also unique in that you can get it from supplementation, diet and the sun. If you get your vitamin D mostly from sun exposure, your levels will vary with the season. Interestingly, parathyroid hormone also changes each season — in the opposite direction. This inverse relationship suggests that you can use vitamin D to balance your parathyroid hormone levels. A 2019 report in the British Journal of Nutrition tested this hypothesis in healthy adults. Participants received 60,000 IU of vitamin D each month for six months. The researchers compared the subjects' vitamin and hormone levels before and after this treatment. The levels obtained before treatment are known as the baseline. Compared to the baseline, the treatment increased the subjects' vitamin D levels, and decreased their parathyroid hormone levels. Vitamin D may affect other hormones, as well. For example, scientists have speculated that changes in insulin growth factor, or IGF, may underlie some of the positive effects of vitamin D. This hormone plays an important role in building muscle in children and adults. A 2018 paper in Medicine looked at the impact of giving vitamin D to healthy adults with a deficiency. Participants received large, oral doses of vitamin D for four months. Then, they received daily doses of 1,000 IU for two months. This intake corrected the vitamin D deficiency in responsive subjects, and it increased IGF in all subjects. Testosterone is another hormone possibly affected by vitamin D. Vitamin D receptors line the male reproductive tract, and vitamin D deficiencies decrease male sexual performance. A 2017 article in The Aging Male explored the possible relationship between vitamin D and testosterone in middle-aged men with a vitamin D deficiency. Subjects received oral vitamin D doses of 600,000 IU each month for 12 months. Compared to baseline, this treatment increased circulating levels of both vitamin D and testosterone. It also improved sexual performance. Interestingly, the treatment decreased parathyroid hormone and estrogen levels. Vitamin D also plays a role in the female reproductive system. For example, taking a vitamin D supplement can help stabilize the hormones of women with polycystic ovary syndrome, PCOS. This finding suggests that vitamin D alters female reproductive hormones. A 2017 report in Nutrients tested this hypothesis by looking the effect of vitamin D on anti-Mullerian hormone in younger women. Subjects received a single 50,000 IU dose of vitamin D or a placebo. Compared to controls, women in the treatment group showed an immediate increase in both anti-Mullerian hormone and vitamin D. Given these data, the authors considered vitamin D a possible treatment for female fertility problems. Other vitamins can alter your hormones, as well. Vitamin E, for example, maintains the hormone balance of laboratory animals that are enduring stressful conditions. That study measured follicle-stimulating hormone, luteinizing hormone and testosterone. Stress affects insulin, too. A 2014 review in PLoS One considered the impact of Vitamin E on insulin production in several populations. The study evaluated published papers, looking at the impact of vitamin E on fasting glucose, fasting insulin and insulin, using a meta-analysis. The results revealed that studies administering vitamin E for more than 12 weeks found that vitamin E gradually decreases insulin over time. Your body also has many vitamin-like substances. For example, your pancreas, kidney, heart and lungs have abundant quantities of coquinone. This interesting chemical has many names, including coenzyme Q10 and CoQ10. It provides cellular energy and has antioxidant properties. These effects make it an ideal candidate for helping you balance your hormones. A 2019 report in the Annals of Medical and Health Sciences Research explored the possibility of using coquinone for hormonal imbalance. These researchers looked at coquinone's effect on anti-Mullerian hormone in Polycystic ovarian syndrome, or PCOS, patients. Participants received 100 milligrams of coquinone each day for three months. Compared to baseline, coquinone caused about a 20 percent decrease in anti-Mullerian hormone levels. Coquinone affects other hormones as well. For example, a 2018 review in Biomolecules describes the protective effects of coquinone. This vitamin-like substance can partly block the damaging effects of reproductive system toxins in animal models by increasing testosterone. Yet coquinone can also decrease testosterone. A 2017 paper in the Journal of Clinical Endocrinology and Metabolism looked at the impact of coquinone on testosterone in PCOS patients. Participants received either 200-milligram doses of coquinone or a placebo each day for eight weeks. Results indicated that this treatment decreased the unusually high levels of testosterone typically found in PCOS patients. These findings show the powerful hormone-balancing effects of coquinone. In medical conditions with low testosterone, coquinone increases the anabolic hormone. In medical conditions with high testosterone, coquinone decreases it. Luteinizing hormone triggers ovulation in females. Women with PCOS have higher levels of luteinizing hormone. Coquinone helps treat PCOS — even at the genetic level. This finding suggests that it may positively affect luteinizing hormone. A 2019 paper in Journal of Pharmaceutical Sciences and Research tested this hypothesis in younger women with PCOS. These researchers gave the participants 200 milligrams of coquinone each day for two months. Compared to baseline, this treatment decreased luteinizing hormone. It also increased growth-stimulating hormone. Most importantly, coquinone increased the low ovulation rate of PCOS patients. Scientists have modified coquinone to create an electron-rich formula known as ubiquinol. Your body better absorbs this form of coquinone, and better absorption should lead to more powerful effects. A 2016 report in the Indian Journal of Clinical Biochemistry tested this hypothesis in women struggling with fertility issues. Participants received 150 mg of ubiquinol each day for several months. Compared to baseline, this treatment caused follicle-stimulating hormone to triple and luteinizing hormone to double. It also decreased the prolactin levels of the women. Each vitamin has a unique mechanism of action. Because all vitamins work in different ways, you can get additive or even synergistic effects by combining them. However, two vitamins can compete with each other as well. This competition may cause them to block each other. These three possible outcomes — additive, synergistic and competitive — make it difficult to predict the net effect of combining vitamins. Pairing vitamins also increases your risk of side effects. Nonetheless, combining vitamins can ultimately produce reliable effects. A 2012 report in Calcified Tissue International explored this possibility by giving vitamin D and vitamin K to postmenopausal women. These researchers used enriched dairy products to deliver a mixture of vitamins and minerals including vitamin D, vitamin K and calcium. Subjects received daily doses of the mixture for a year. Compared to a control group, women taking the combination showed an increase in IGF levels. This treatment also increased anabolic markers like bone mineral density. Preliminary research done in laboratory animals suggests that minerals can also help balance hormones. For example, selenium and zinc can reverse the damage caused by artificially induced hypothyroidism. Human studies support the idea that minerals play an important role in hormone regulation. Healthy women failing to get enough sodium have more follicle-stimulating hormone and less progesterone, according to a 2018 report in the British Journal of Nutrition. This study also showed that not getting enough manganese is associated with an increased risk of reproductive dysfunction. Vitamin B7, also called biotin, contributes to the manufacture and breakdown of many important chemicals in your body. Taking biotin can alter hormone tests without actually altering hormone levels. For example, patients taking biotin might show excess thyroid hormone when tested. Having high levels of this hormone suggests a diagnosis of Grave's disease. In reality, the vitamin has interfered with the test result and not changed the thyroid gland. Similar false reports have occurred with testosterone assays. A 2019 paper in Biotechnology Advances notes that this technical problem remains unresolved. Biochemists have yet to find a blood test that resists biotin contamination. Thus you should avoid taking biotin for at least 48 hours before having your blood drawn.